Every day, I see amazing things. Beau was given three months to live before his pet parents learned about stereotactic radiosurgery (SRS). 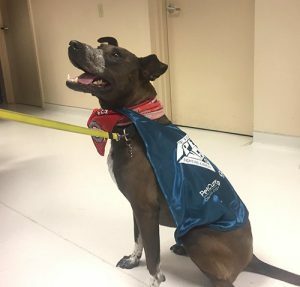 His human mom, Cindy, called Beau’s treatment and recovery “miraculous.” Snickers was on his way to be euthanized when his dad decided he couldn’t go through with it – and turned the car around. Addy’s mom was skeptical when initially given a treatment recommendation that wasn’t good enough for her pet. She rolled up her sleeves, found PetCure Oncology on the internet, and drove more than 500 miles for SRS. Beau, Snickers and Addy are among nearly 500 pets that have been treated for cancer with SRS by PetCure Oncology over the last couple of years. We love sharing stories about PetCure Pet Heroes, and for good reason. Each has a story that is unique, remarkable and inspirational. They remind us of how far we have come while at the same time encouraging us to push forward. But how, exactly, does it all work? Let’s take a closer look at Bindi’s case from a clinical perspective. Background: Bindi presented with a large mast cell tumor on the bridge of her nose. A CT scan revealed the mass to be deeply embedded and attached to underlying structures. As a result, complete surgical removal would have required extensive reconstructive surgery. MCT’s are known to be radiation responsive. Stereotactic radiosurgery (SRS) was recommended with excellent long-term prognosis (24+ months) if local control could be achieved. Treatment: The pet parent elected SRS. Since mast cell tumors often respond very rapidly to radiation, treatment was delivered in a single fraction of two arcs and 20 Gy on 8/14/15. Treatment plan resulted in good tumor dose homogeneity and completely spared both eyes. Outcome: Six- and 12-day follow-ups revealed visibly smaller tumor and no reported side effects. Three-month CT confirmed significant shrinkage and minimal swelling was visible. Bindi was determined to be in complete remission at that point. 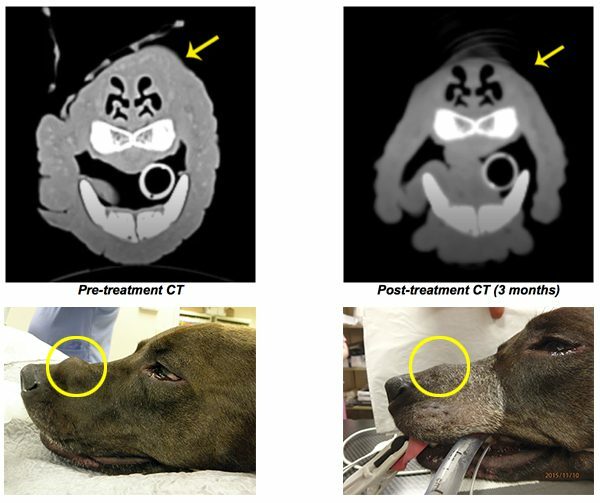 At the time of this case study, Bindi is alive and healthy 18 months post-treatment. Her only reported side effects were discoloration of fur over the treatment site and a discolored tooth. Relevance: Mast cell tumors are among the most common tumors found in dogs, accounting for 7% of cancer treated by PetCure Oncology. They are extremely radiation responsive and can shrink 50-75% within 12-24 hours of initial radiation dose. Due to this rapid response, single-session treatments may be preferable to ensure precise delivery of high-dose radiation to the tumor before it begins to shrink and change shape.